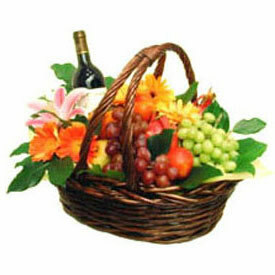 Send Fresh Seasonal fruits in a basket - 1/2 Kg Grapes, 3 Pcs. 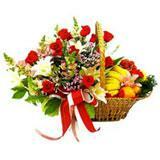 Apples and 3 Oranges with a bottle of fruit juice (1 liter) decorated with Pink lilies and Orange and yellow gerberas to your loved ones in all cities in India and make their day more memorable. 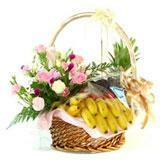 This is a cute way to say you care by sending gifts at midnight to your friends and family. 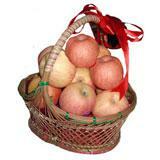 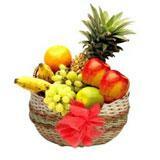 Along with this basket, you can also send Gifts across India to your near and dear ones through GiftsAcrossIndia.com. 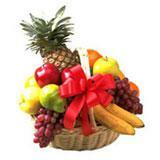 Please note : If a particular fruit is not available, then we will replace it with another fruit.